The Schluter®-KERDI-DRAIN-A adaptor kits are designed to convert clamping ring drains by equipping them with an integrated bonding flange. 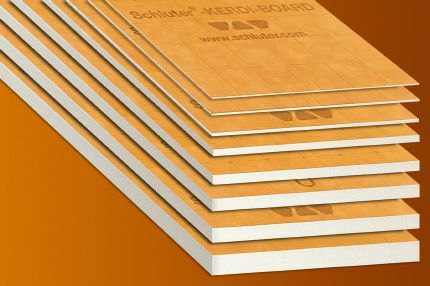 Schluter®-KERDI-DRAIN is a floor drain specifically designed to allow connections to Schluter®-KERDI or other load-bearing, bonded waterproof membranes. The membrane is adhered to the large integrated bonding flange to form a waterproof connection at the top of the drain assembly. 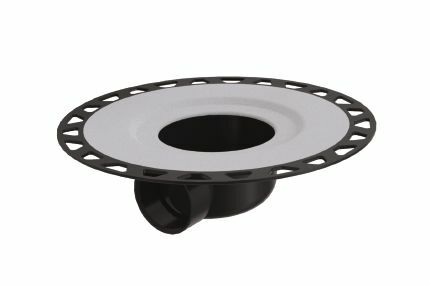 KERDI-DRAIN consists of a drain casing and fully adjustable grate assembly or covering support to which tile is applied. The grate assembly accommodates a wide range of tile thicknesses and allows lateral and tilt adjustment as well. The covering support is placed flush with the top of the bonding flange and can therefore accommodate any thickness tile covering. The grates are installed in conjunction with a height adjustment collar or lateral adjustment ring, which are made of ABS to allow for simple and convenient adjustment when setting the tile. Drain grates are available in stainless steel with a polished or oil-rubbed bronze finish and in anodized aluminum with a brushed copper, brushed brass, or brushed nickel finish. The polished stainless steel grates are available in 4" (100 mm) -square, 6" (150 mm) -square and -round versions. All other grates are available in the 4" (100 mm) -square version only. The tileable covering support is a 4" (100 mm) -square stainless steel plate with Schluter®-KERDI laminated on the surface to allow for bonding of ceramic or stone tile, which creates a virtually invisible drainage line. Please note: Grate assemblies included with the plastic KERDI-DRAIN featuring 3" (75 mm) outlets and the residential adaptor kits only allow vertical and tilt adjustment (no lateral adjustment). Also, the tileable grate and the 6" round or square grates are not compatible with the 5 ¼” adaptor ring flange. If a clamping ring drain is installed, replace with KERDI-DRAIN or convert using the KERDI-DRAIN adaptor kit. 1. Remove the clamping ring from the installed drain and save the bolts. Align the bolt pattern of the clamping ring with the adaptor ring and punch the matching inserts through the adaptor ring. 2. Apply a 1/4" - 3/8" (6 mm - 10 mm) bead of KERDI-FIX to the installed drain flange. Place the adaptor ring on the installed drain, re-insert the bolts, and tighten evenly. Make bolts finger-tight plus 1/4 turn; over tightening may warp the ring and result in leaks. 3. Slide the adaptor flange into the adaptor ring and ensure full support underneath with mortar or the detachable center section of the foam tray. Depending on the installed drain elevation, it may be necessary to install a polystyrene foam panel, tile backer board, etc. prior to the tray. 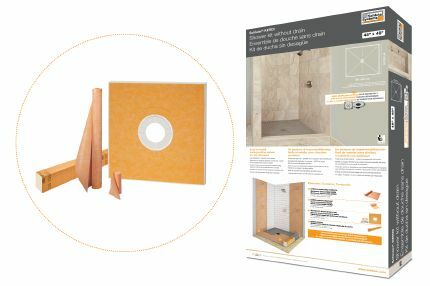 Install the tray as per the instructions in the Schluter®-Shower System Installation Handbook. Note: Schluter®-Systems recommends a leak test be performed on the connection between the drain and the waste line prior to continuing with the remainder of the installation whenever possible. 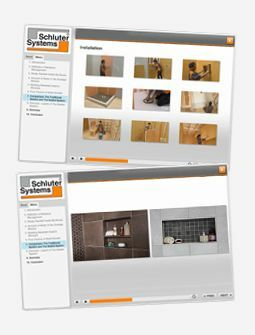 Schluter-KERDI-DRAIN requires no special maintenance and is resistant to mold and fungi. The grates may be removed to clean the drain housing and the drain pipes. Clean the grates using common household cleaning agents. Stainless steel grates exposed to the environment or aggressive substances should be cleaned periodically using a mild household cleaner. Regular cleaning maintains the neat appearance of stainless steel and reduces the risk of corrosion. All cleaning agents must be free of hydrochloric and hydrofluoric acid. Stainless steel surfaces develop a sheen when treated with a chrome-polishing agent. Do not use abrasive or alkaline cleaning agents.